Deakin University, Melbourne, recently hosted another iteration Transoceanic Visual Exchange (TVE) from April 11th-27th, 2018 in ‘The Project Space‘, the contemporary & experimental exhibition space at Deakin’s Geelong Waterfront Campus. 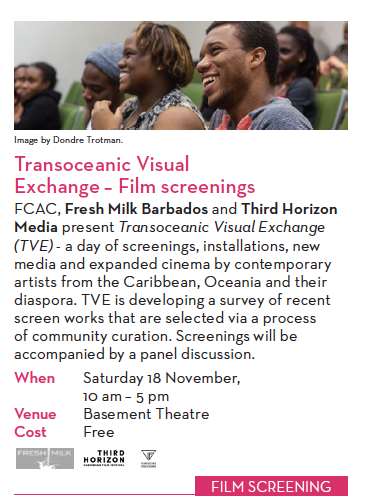 FCAC, Fresh Milk Barbados and Third Horizon Media present Transoceanic Visual Exchange (TVE) – a day of screenings, installations, new media and expanded cinema by contemporary artists from the Caribbean, Oceania and their diaspora. TVE is developing a survey of recent screen works that are selected via a process of community curation. Screenings will be accompanied by a panel discussion.